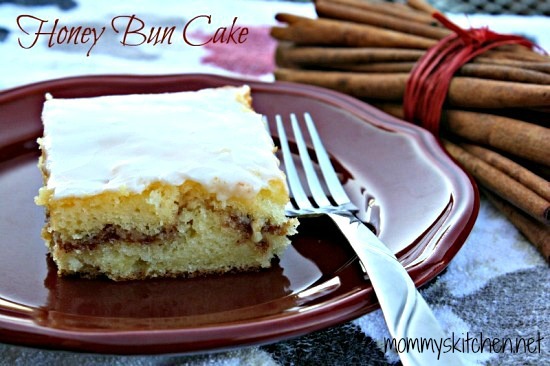 A Honey Bun Cake is a moist vanilla cake with a cinnamon sugar filling and topped with a vanilla glaze. I love old recipes that have been handed down from one generation to the next. Let's face it folks old fashioned recipes are always the best. Well the recipe I'm sharing today for this deliciously easy Honey Bun Cake follows that same pattern. I can't remember exactly when mom gave me this recipe, but I know it was over 15 years ago. Whenever we stopped for a visit at my mother in laws house, I followed the same routine. As soon as I arrived, I would ask mom where her recipe box was? I would sit at her kitchen table and go through all her recipes jotting down the ones that caught my eye. Most of her recipes were really old and they always had a story. Those were always my favorite. It was always such a treat sitting with mom, listening and writing each of the recipes down. This came to be something I looked forward to on our visits besides her great meals she would cook for us. Most times it was her homemade meatloaf. Funny thing to this story is I got this recipe long before my little honey bun boy was ever a twinkle in my eye. Who would have thought that my son Carson would come to love this cake as much as I do. My little guys favorite Little Debbie snack cake is the glazed honey buns. I can never get out of the store without buying at least one box. That boy loves his sweets, but don't we all? The first time I made this cake for him he was hooked. This honey bun cake recipe is a bit different than some I've seen online. Moms recipe calls for butter instead of oil. It also uses plain yogurt in place of sour cream. The yogurt was a change that I made because I was out of sour cream one day. In the end, I preferred the yogurt. The filling is also a bit different as it consists of a mixture of the reserved dry cake mix, brown sugar, cinnamon and pecans. The pecans are optional, but really good. I hope you'll give this recipe a try? Preheat oven to 350 degrees, grease bottom only of 13 x 9 inch baking pan. Remove ½ cup dry cake mix and set aside. Add remaining cake mix to a large bowl, Add butter, yogurt, eggs and vanilla; beat at medium speed using an electric mixer. Spread half of the batter in the bottom of the baking pan. In a separate bowl; stir together reserved dry cake mix, brown sugar, cinnamon and nuts if using. Sprinkle over batter. Spread the remaining cake batter on top of the filling. To make spreading easier drop batter by dollops over cinnamon mixture, then spread using an offset spatula. Bake at 350 degrees for 35 - 40 minutes or until golden brown and cake springs back when touched. Remove from oven and let cake cool slightly. Prepare the glaze. In a medium size bowl add the powdered sugar, milk and vanilla. Stir until you have a semi-thin glaze. If the glaze is too thick keep adding a bit of milk until it's to the consistency you want. Poke the top of warm cake with a fork or toothpick. Drizzle and spread half of the glaze completely over the cake and let it seep into the cake. Let cake sit for 15 - 20 minutes and then pour the remainder of the glaze on the cake. Cool for at least one hour before slicing. I think the combination of the butter and the yogurt make this cake so moist. i have vanilla greek yogurt, do you think i could use that if i left out the vanilla extract? Or should I still leave that in with it? I think the vanilla yogurt would be fine. And yes probably leave out the vanilla. LMK how you like it. I love recipes that are past done from generation to generation. This cake looks really yummy. Made the cake today and just tried it. I love the flavor! 2 things though. I put it in for the minimum time and I think that was too much. Next time I think I'll take it out 5-10 minutes before 40 min. Also, not sure why but the icing barely covered the top of my dish. Wondering if I should have doubled it so it soaked into the cake more. But all in all, I will be keeping this recipe for sure. Cici, that actually is a double recipe for the glaze. What you can do is add half of the glaze and let it run down in the holes and then wait about 15 minutes and add the rest of the glaze. Or you don't have to poke it all with a fork. Just add the glaze. Love the story! That's the best part of food, isn't it? The history and the memories. Mmmm...made this today and even my picky husband loved it! Don't tell but I ate 2 pieces! :) delish! I know what you mean Sara. This is one cake that is hard to resist for me. I make this every year for my boyfriends birthday. He is obsessed with this cake. What I do is put the glaze in the microwave before I pour it over the cake. It loosens it up and makes it seem like I have more because it spreads better. Just a suggestion! My son decided that he wanted this cake the other night, but I didn't have a box of cake mix... or yogurt... or sour cream... or cinnamon. So, I found a plain white cake recipe and mixed together all the dry ingredients. That took care of the cake mix. I used a cup of ricotta cheese mixed with a little milk for the sour cream/yogurt. And for the cinnamon, I used cloves, nutmeg, and ginger. It came out wonderfully! So, this cake holds up well to substitutions, even when you have almost none of the ACTUAL ingredients. I've made a similar cake though this version is a little healthier-bonus! Lovely photos and I have to tell you - I have the same plates as you! Got them at Walmart when we moved into our house 10 years ago! When you say 2 sticks of butter, how many grams or oz is that please? Australian reader so not sure of that quantity as we don't have sticks of butter just big blocks. Australia, each stick = 8 oz. Australia, each stick of butter is 4 oz. 4 sticks of butter make up a pound. The gas station is going to be sad not to see me anymore since I now have access to the recipe of my favorite "get through the morning" treat! Thank you for that! They're going to miss me. I have tried a similar recipe at a party in the past. The cake was good, but I have not had the opportunity to try it since then. I will have to make your recipe. It looks tasty! We have a similar recipe that is passed down from generation to generation. I love being able to make things that remind me of my childhood or even my family of theirs. I used to make zeppoli for my grandma after she had dementia and was no loner able to make it herself. Her mother used to make it for her on Christmas every year so I enjoyed bringing it to her. This looks so good! What an amazingly delicious recipe! I love honey buns, and you just gave a whole cake recipe :) You can't see my excitement, but I am literally visualizing the taste of heaven right now! I will be making this, this weekend! Oh my gosh this cake looks so good! What a creative recipe. I have a picnic to go to next weekend. I might be bringing this as my dish to share. Looks so good and really easy to make. I've never heard of a honey bun cake but I can only imagine how delicious and moist it must be! I am going to give this family tradition of yours a try. Hopefully it will be something my family will love too! It sounded good already from your first line describing it...and I love vanilla cakes! This will be a sure winner having been a recipe handed down from loved ones. Thanks for sharing.